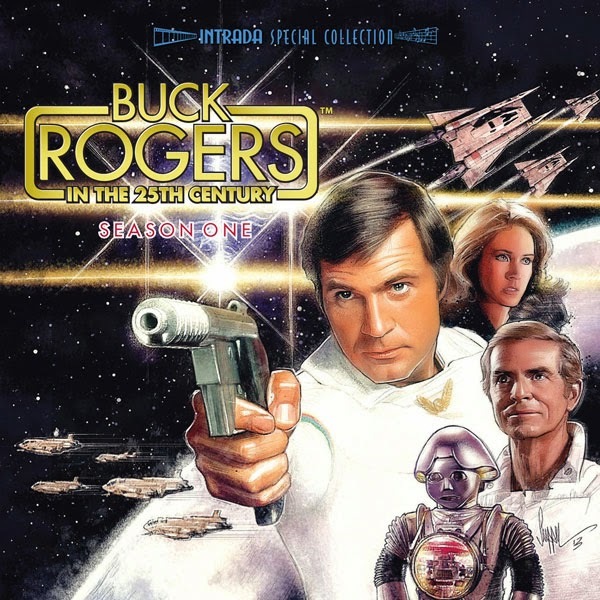 Intrada follows its series of Battlestar Galactica albums with the release of Buck Rogers in the 25th Century, featuring music from a selection of season one episodes. Unlike Galactica which featured music composed exclusively by Stu Phillips, Rogers relied on a stable of different composers. While each composer has his own distinctive voice, they all shared a basic understanding that Buck is an old-fashioned hero. He is brave, generous and honorable; always quick to do what is right. He is also suave, funny and fiercely competitive. The series’ humanity and good humor needed to come through in every episode, however intense the action, however cornball the sentiment, and however outlandish the alien trappings. Music played a major role in striking that balance. The scores of Buck Rogers are exciting, funky, tender and strange— but they are never less than fun, and they never lose sight of the hero at the heart of it all. The album also includes the added bonus of "Jelly Belly," a source dance cue from the pilot The Awakening that fans have been seeking for years. The scoring sessions were recorded directly onto three-channel stereo tape at the Universal Studios The format music (bumper, main titles and end credits) were more elaborately recorded on full 24-track formats, however. All of these elements, both ½″ and 2″, were housed in the Universal vaults in pristine condition—with the sole exception of the second part of “The Plot to Kill a City,” which was fortuitously preserved by the composer on ¼″ full-track (mono) tape. Buck Rogers in the 25th Century stars Gil Gerard as Captain William “Buck” Rogers, an astronaut who is frozen in space for more than 500 years before being discovered and revived. He quickly becomes embroiled in a conflict between the Draconian Empire, led by Princess Ardala (Pamela Hensley) and her aide, Kane (Henry Silva in the pilot, Michael Ansara thereafter), and the embattled residents of Earth, represented by Colonel Wilma Deering (Erin Gray) and Dr. Elias Huer (Tim O’Connor). Buck soon finds new purpose as a galactic “wild card,” bringing his unique perspective to dangerous missions on behalf of the Earth Defense Directorate. Makes me want to go watch the series again. Erin Gray was so hot.